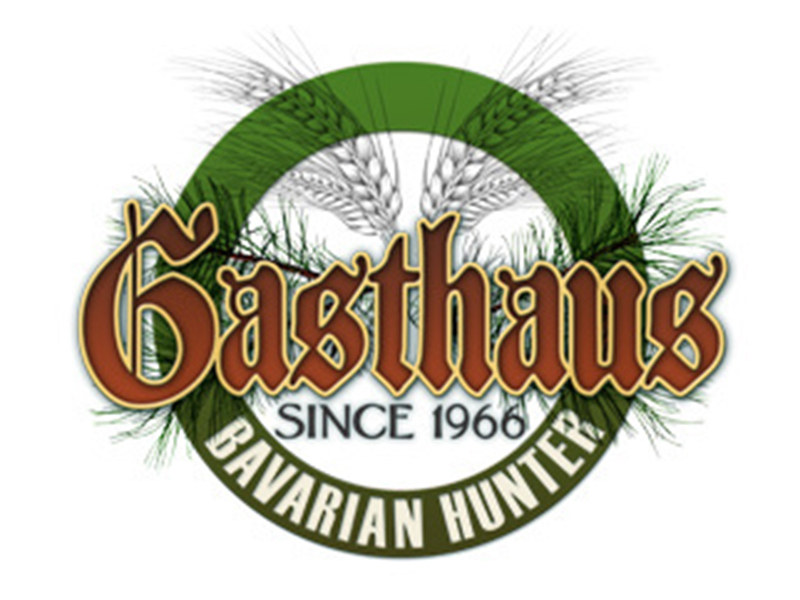 Joanne and I have been to GASTHAUS BAVARIAN HUNTER on about four occasions in the last few years, mostly recently with our grandkids to introduce them to one of Minnesota’s foundational cuisines. 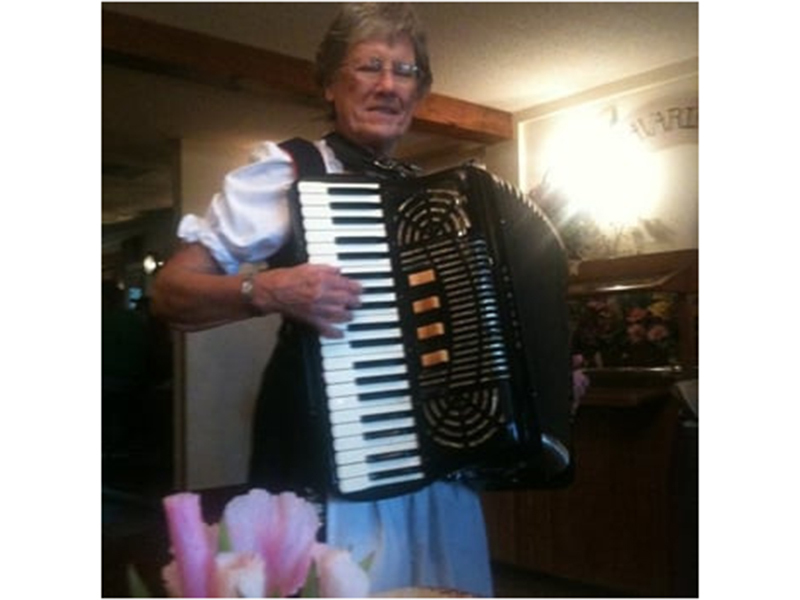 I’d always teased the kids about how bad German food is, and how I, being of mongrel ancestry and therefore not “contaminated” by German food, have a much keener palate than their grandmother – who, according to ancestry.com, is 87% German. 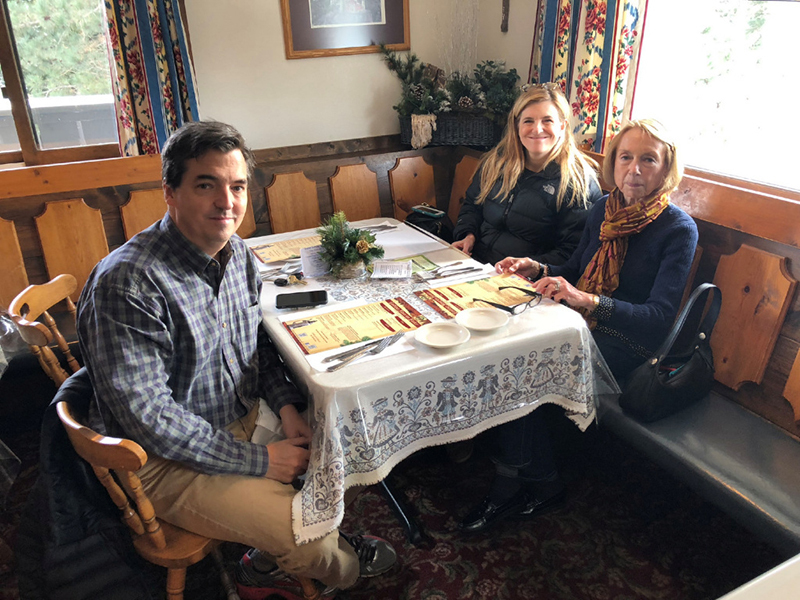 Our son, David, from Boston, was in town a few weeks ago and along with our daughter, Jennifer, we made the trip to Stillwater for lunch at the GASTHAUS. 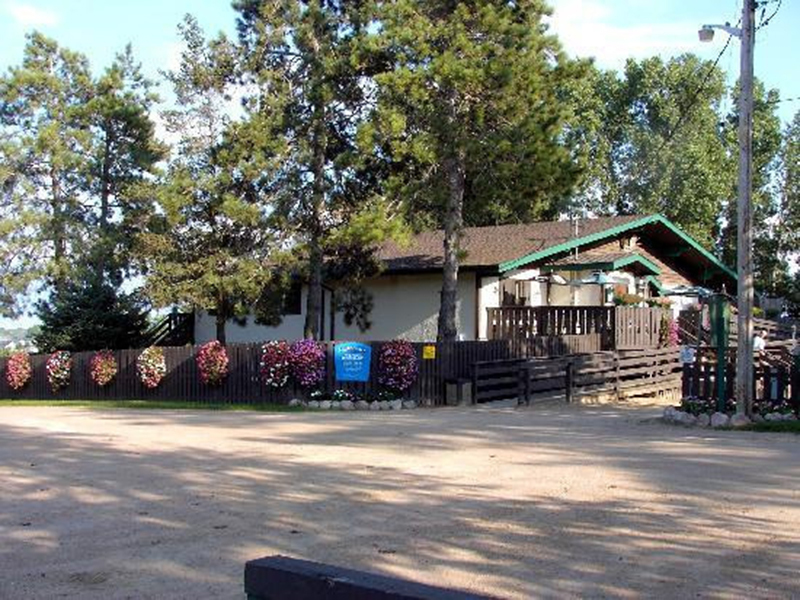 So what is it that I like about this place? 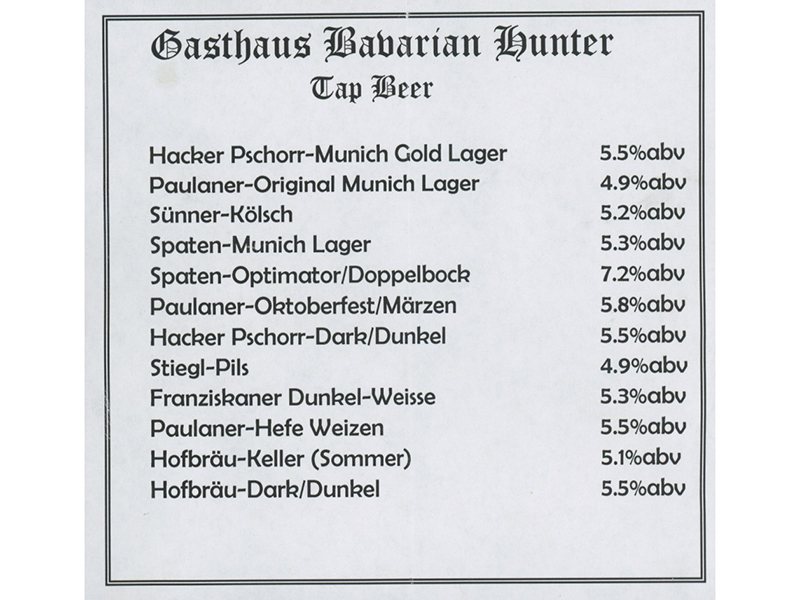 GASTHAUS BAVARIAN HUNTER is over 50 years old…The place is REAL. 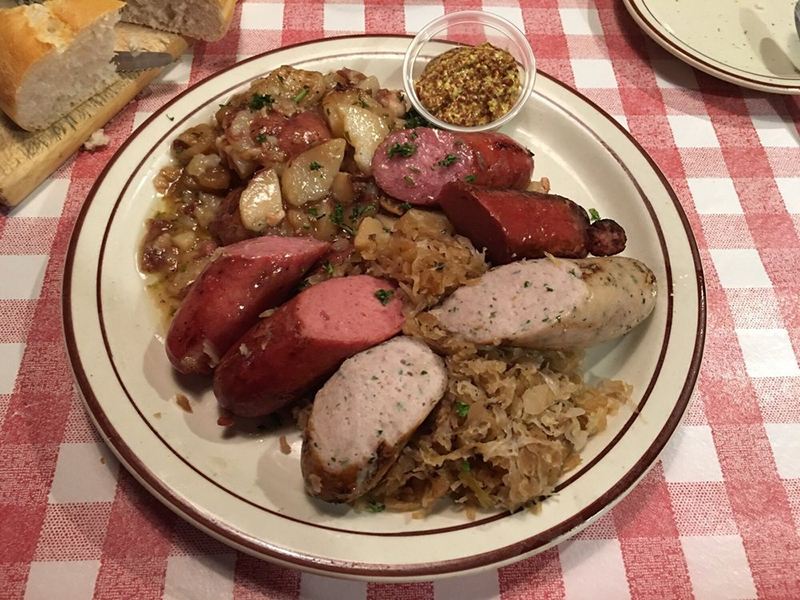 It’s a “pure play” – no German tacos or burritos here. 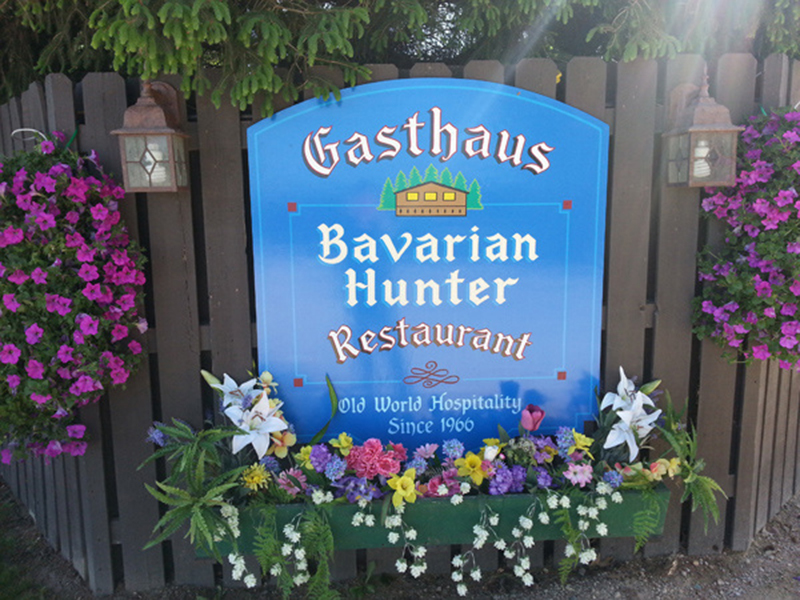 The Pine Forest wood-veneer setting is evocative and believable for a Bavarian gasthaus, too. 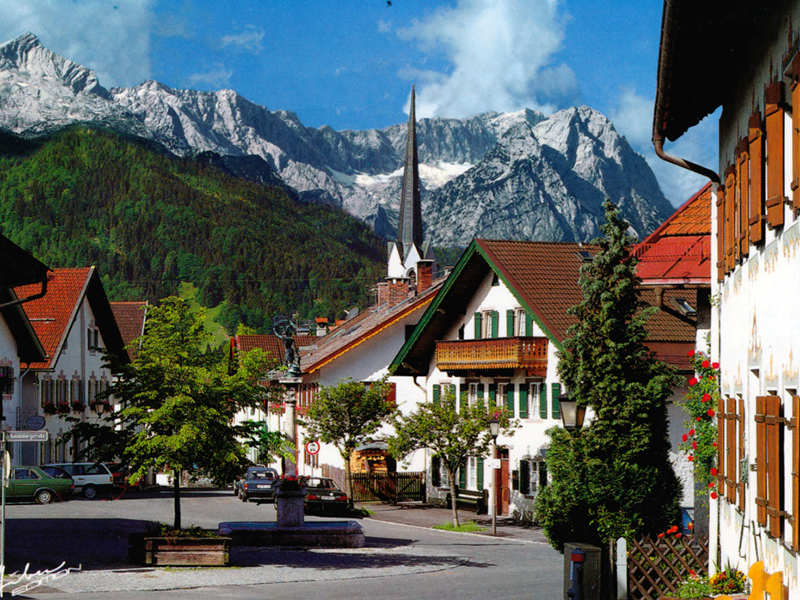 David, who travels to Germany often, said this place feels like it could actually be in southern Germany. 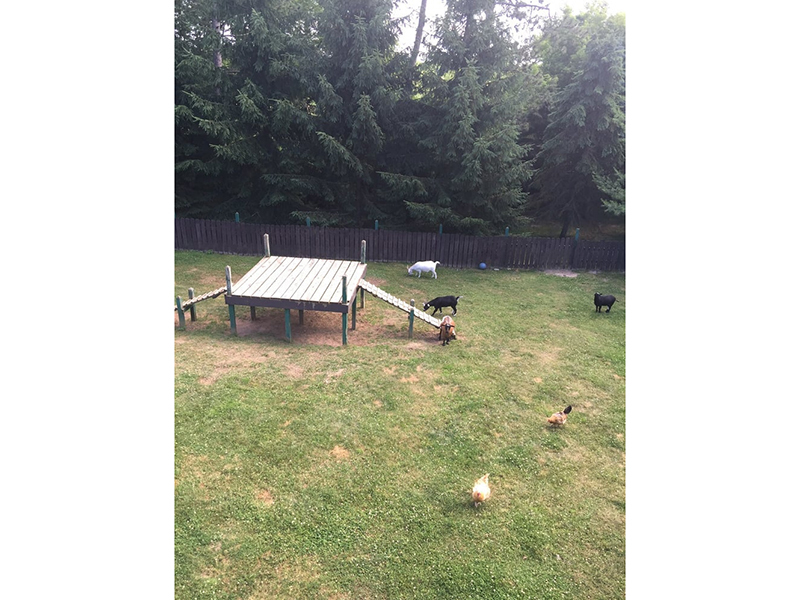 They even raise goats out back of the restaurant, something APPLEBEE’S and RED LOBSTER do not do. 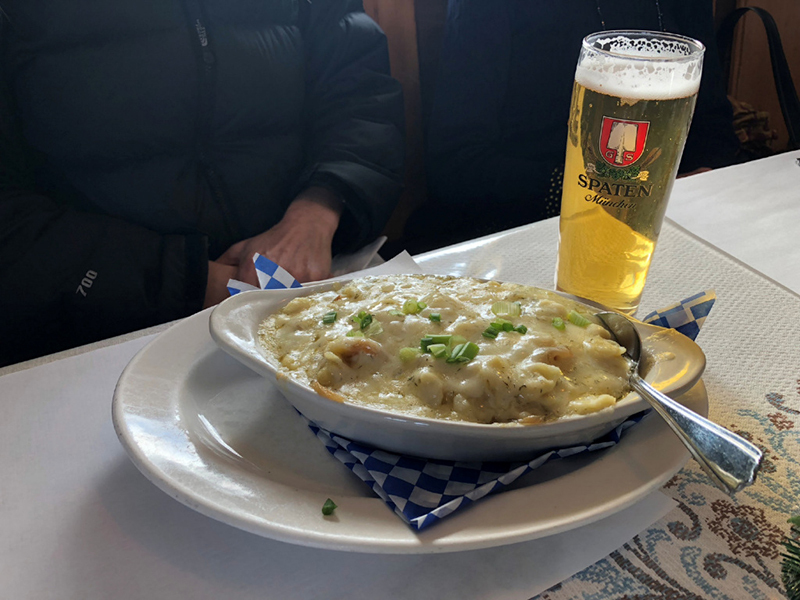 We settled in for what became about a two-hour lunch – starting, of course, with German beer…even had a second glass. 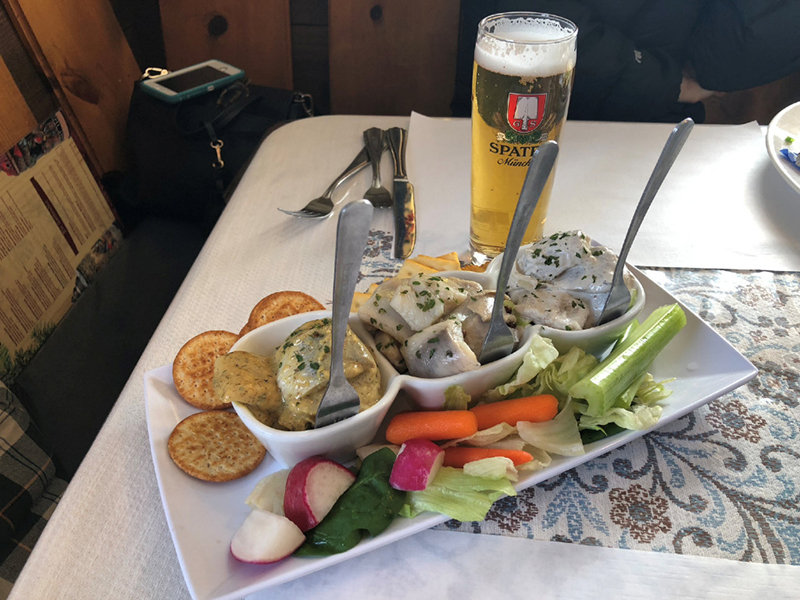 Breads were dense, dark and chewy, and we followed up with a Herring Sampler Trio – all pickled: one plain, one in red wine, and one bathed in mustard ¬– complete with raw veggies, which provided a nice counterpoint crunch. 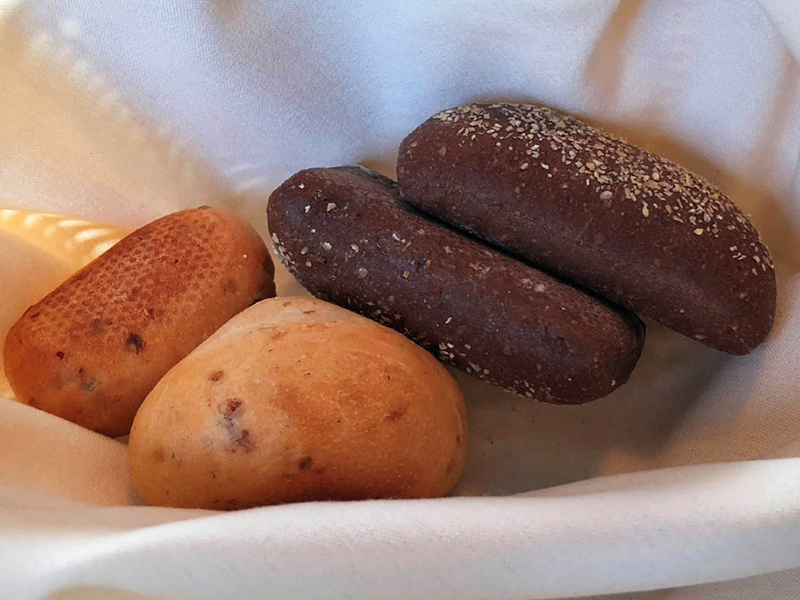 It came with a half-dozen Ritz Crackers, which actually worked quite nicely ($11.95). 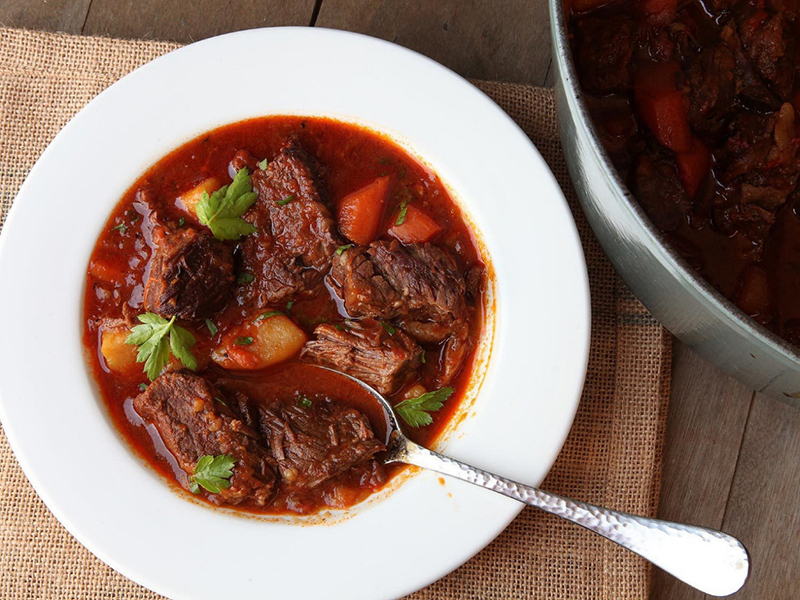 Although I’ve always thought of Goulash as Hungarian, I guess it isn’t too big of a step to imagine it migrating to Germany. 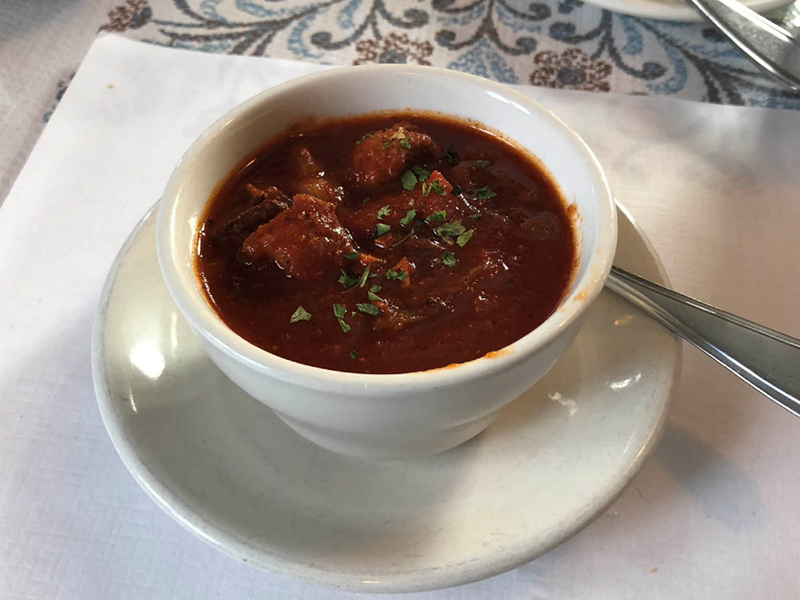 David had the Goulash Soup, delicious and loaded with paprika. 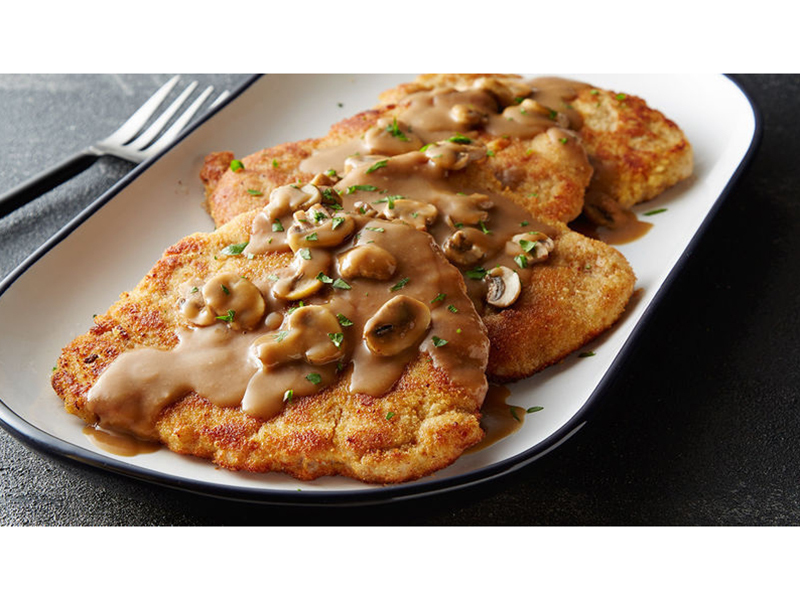 Two classifications seem to rule the menu: sausages of all stripes, and a variety of schnitzel – veal, chicken and pork; the latter, called Jaegerschnitzel, served with a mushroom gravy. 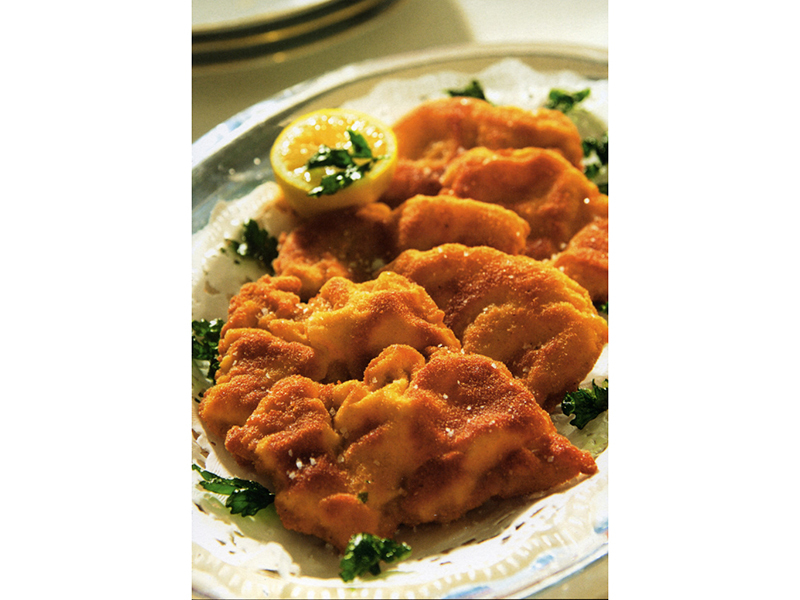 My favorite, however, is the simple and wonderful classic veal preparation of wiener schnitzel, served with a squeeze of lemon. 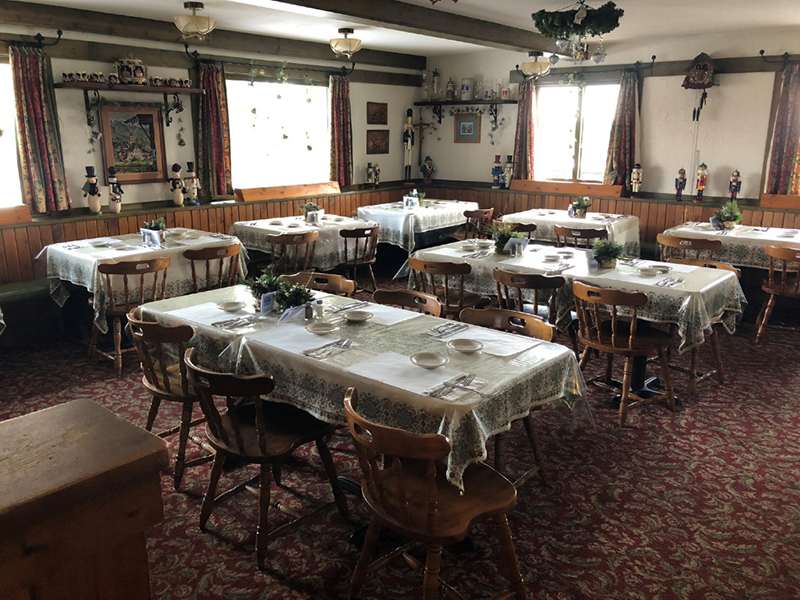 All are accompanied by side dish choices typical of a Bavarian restaurant – red cabbage, potato dumplings, spaetzle, sauerkraut, mashed potatoes, and German potato salad. 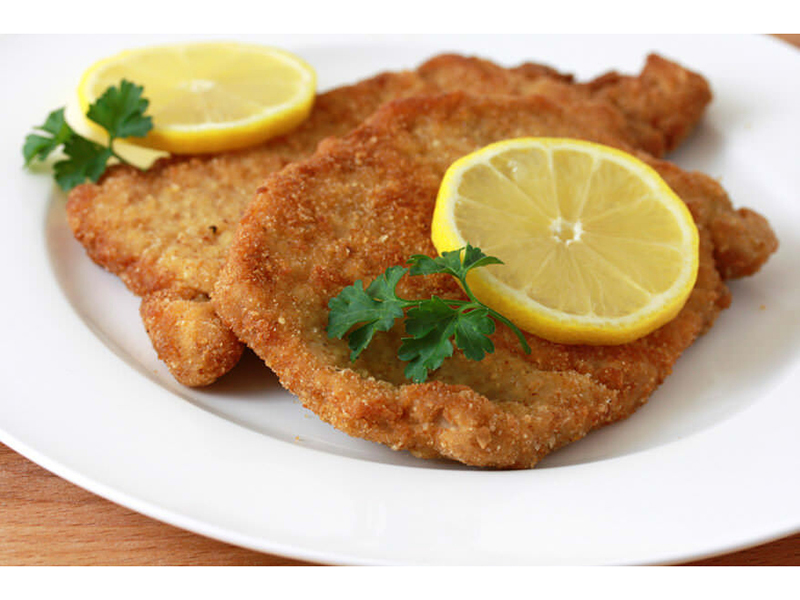 I don’t think you could make a bad pairing. All are authentic, all are good. 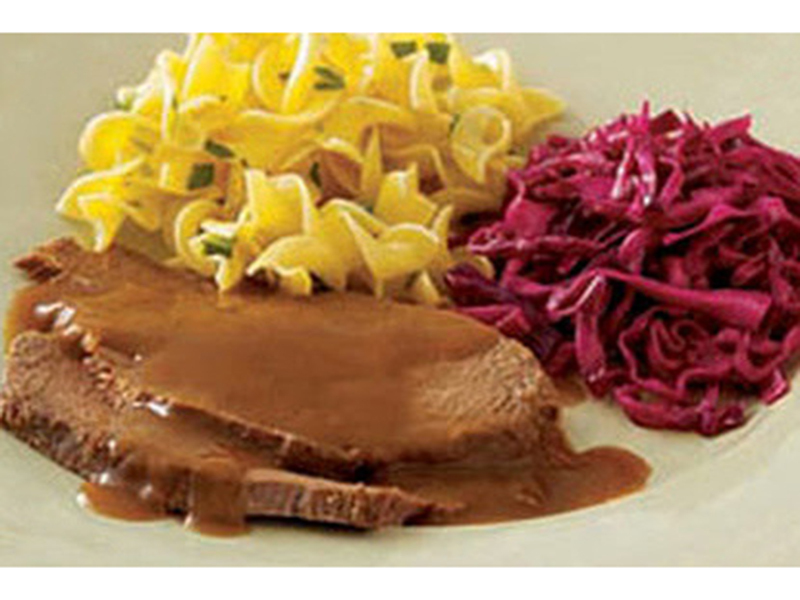 We didn’t try the sauerbraten on this trip. 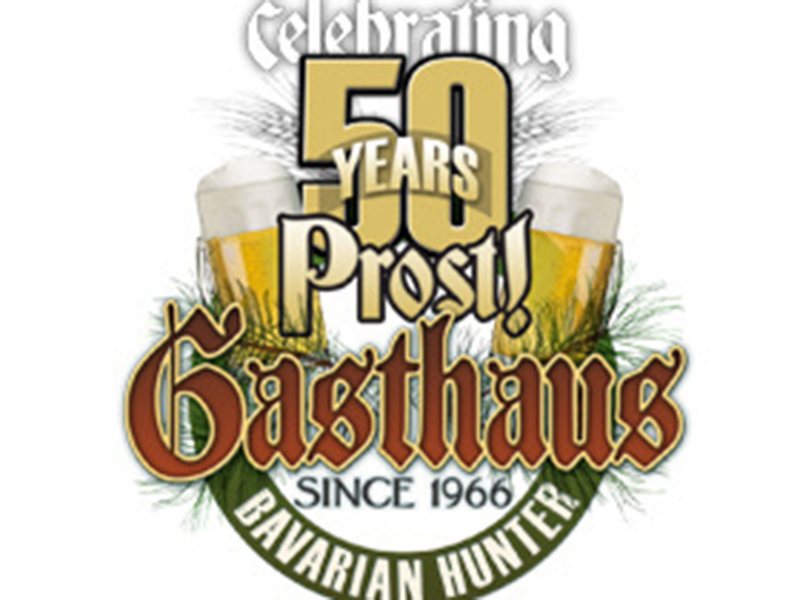 That’s simply German for “potroast.” Gasthaus marinates theirs for a couple of days before cooking and makes a gravy from the marinade. 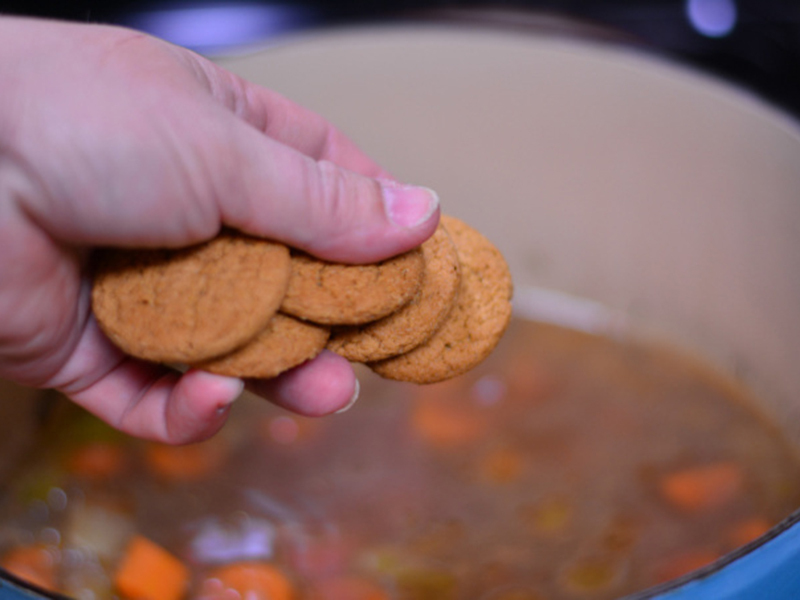 It has a peculiar, delicious flavor sensation that you can’t quite put your finger on…….GINGER SNAP COOKIES! 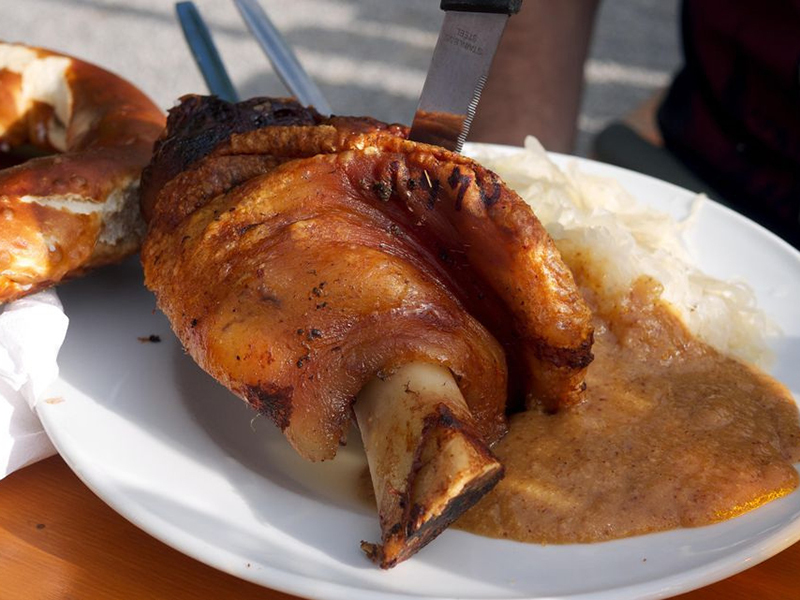 I took the German peasant route and ordered the football-sized “schweinshaxe” – the pork knuckle. 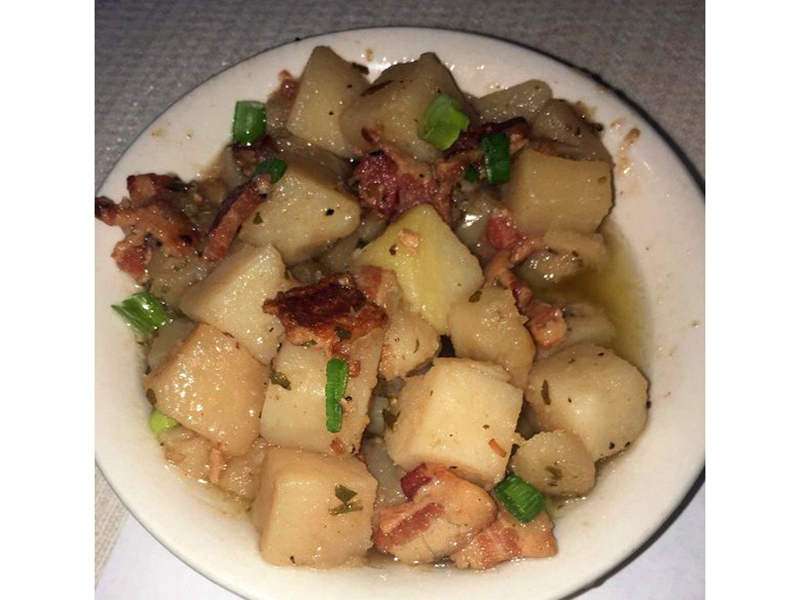 It’s the part of the pig’s leg just above the ankle. 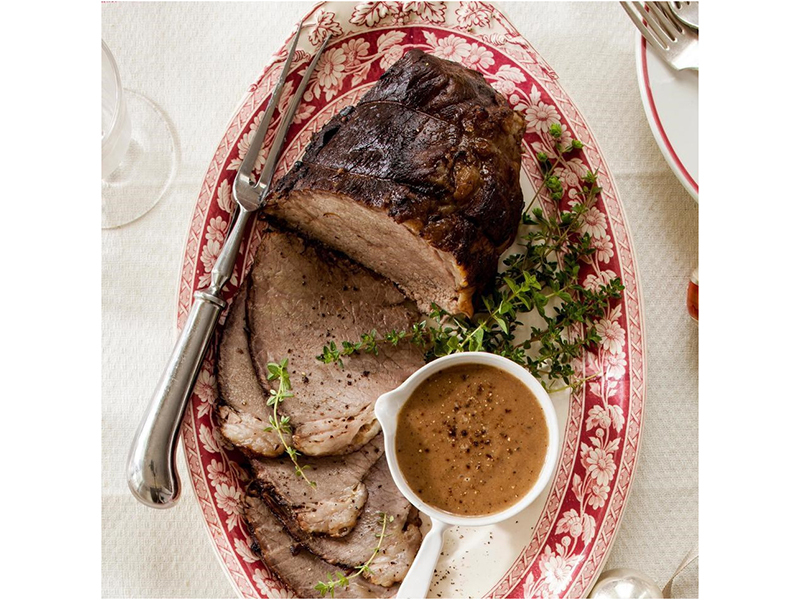 This, too, is marinated for days, then roasted for 2-3 hours until the meat falls off the bone. 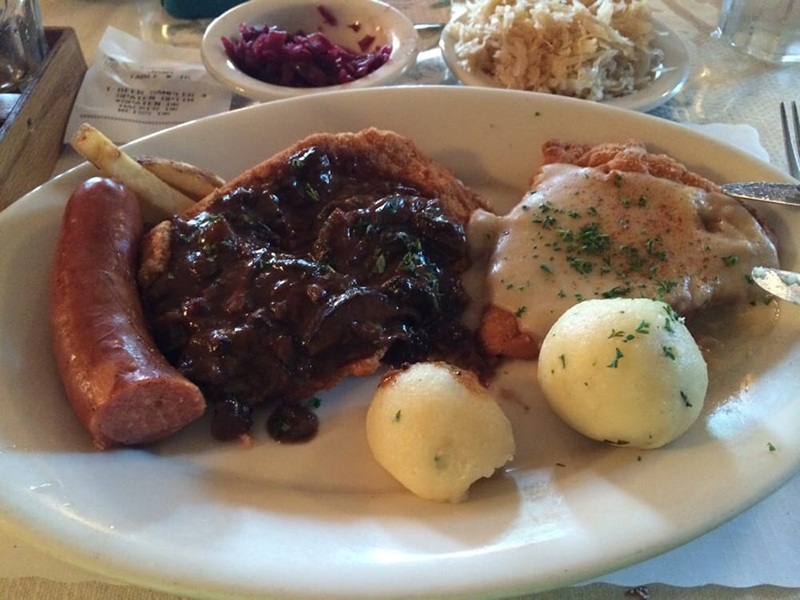 Served with mashed potatoes and sauerkraut, it’s a Teutonic bargain at $12.75. 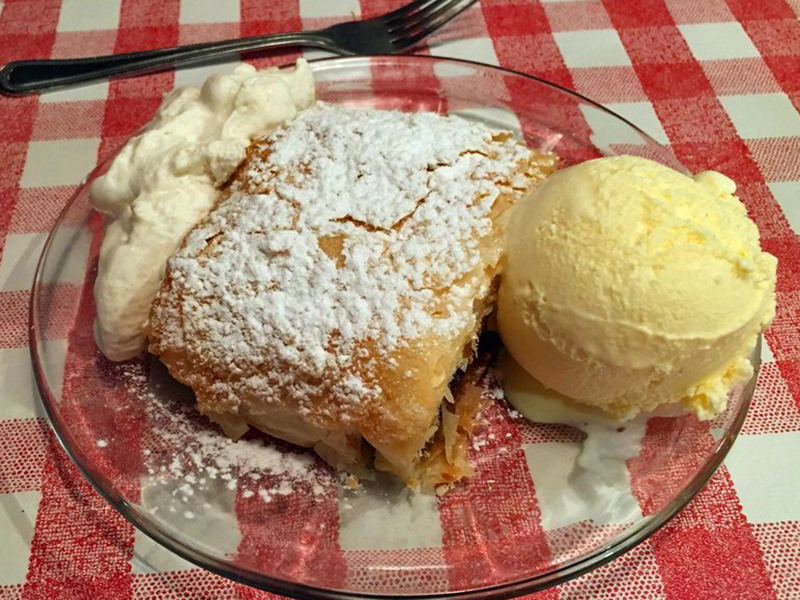 You really need to finish off your feast with the Apple Strudel. You really, really do. 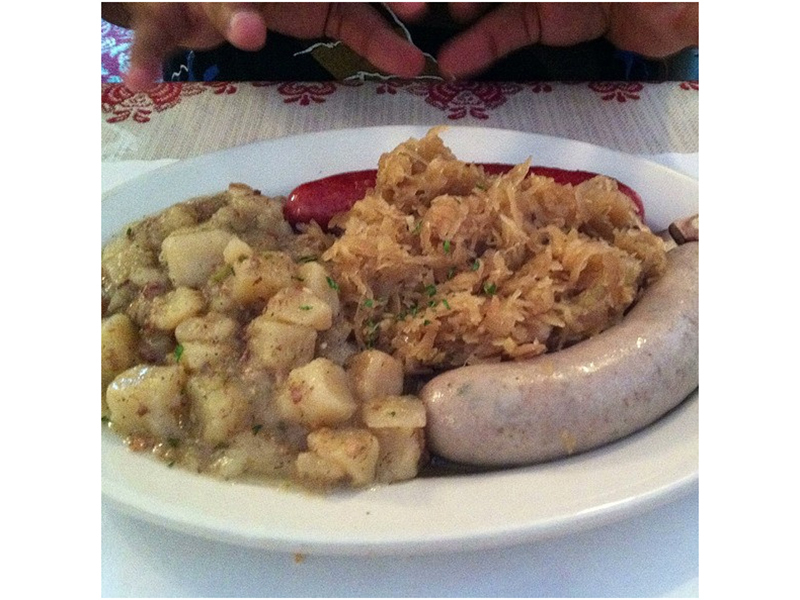 We LOVE German food and have been to the local restaurants, now numbering only three, many times. 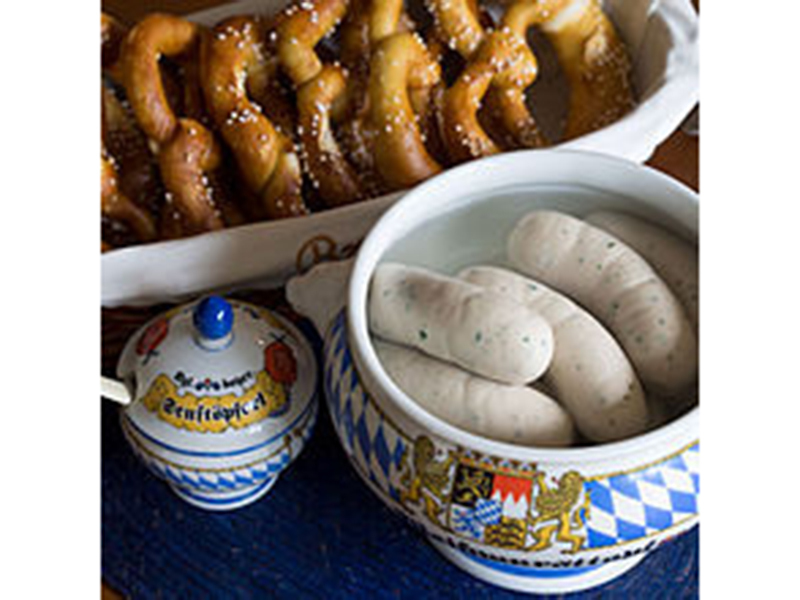 We went to Germany in 2014 and were delighted to have German food at every place we went. 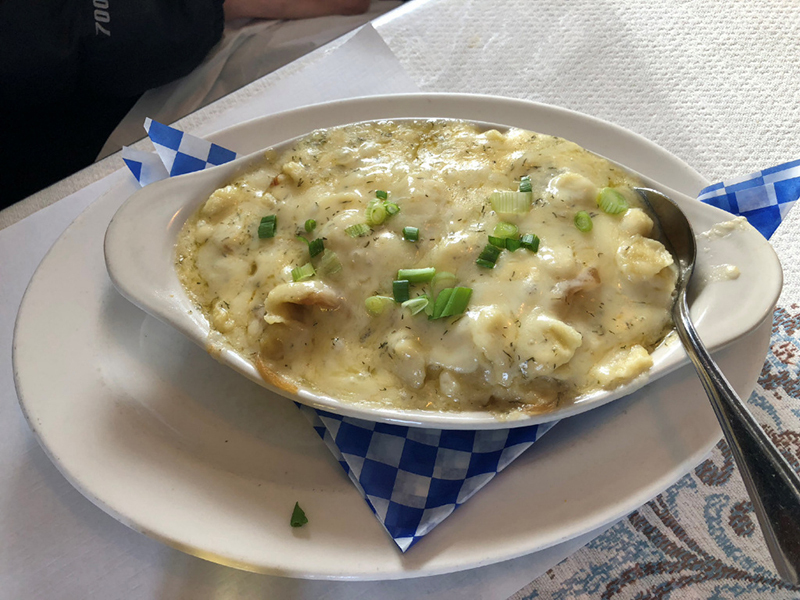 This is most definitely a cuisine and shouldn’t get the scorn it does. 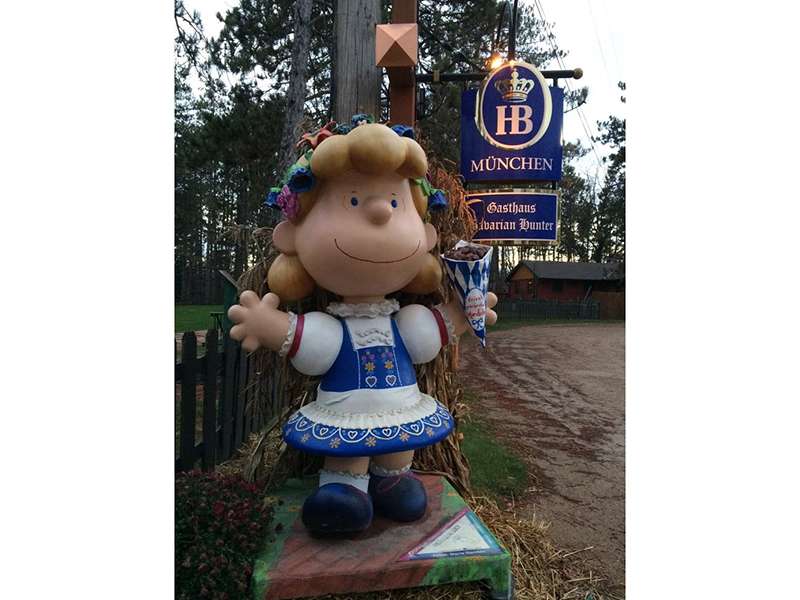 The majority of MN natives are Germans by ancestry–there should be more German restaurants here. 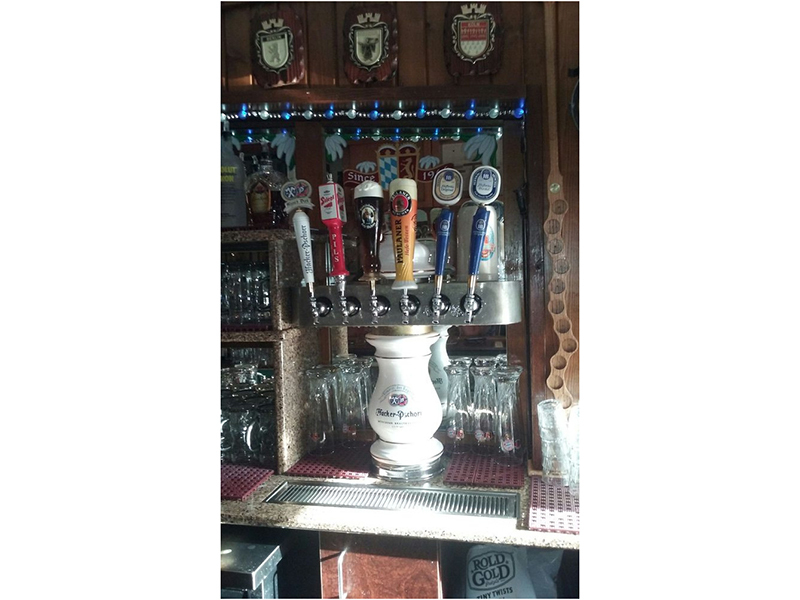 Gasthaus is a gem. 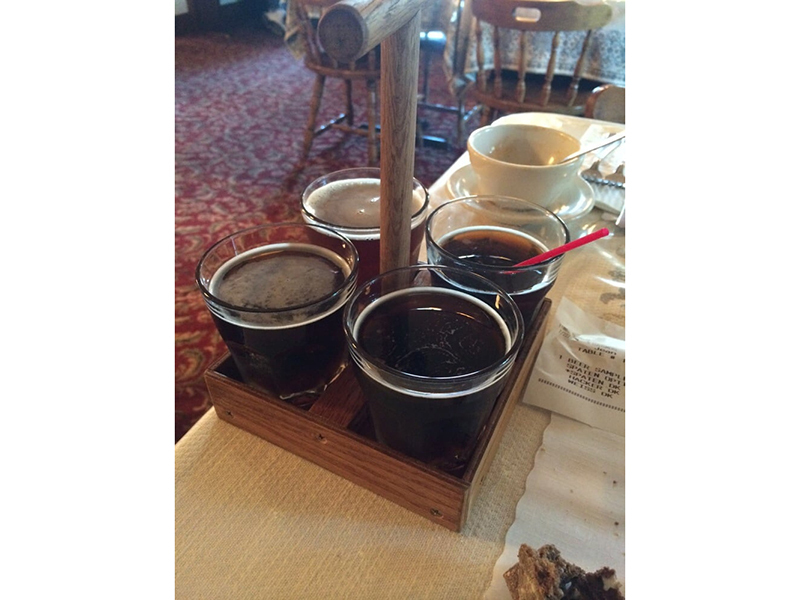 We also love the Black Forest Inn, also over 50 years old. Such an amazing article by you friend i am really very glad to read it.